ah ok, maybe they have others? GR9 idea. Have emailed them. I have got some great transfers from H Llloyds "can't be beaten y'know" but your bike may be on the modern side for them?? Unless its a coincidence, I suspect H Lloyds and Decals2000 are one and the same as they are both on holiday until the 1st of May. I will speak to them tomorrow and find out. There are no Flyer decals at all that I can see on the PDF on the H Lloyd website and there are these on Ebay so you never know. Yep H Lloyd and decals2000 are the one and the same...I found out when trying to find out about some Dynatech 500 decals. Just curious, who is spraying the frame? Have spoken to Triple S in Bingley. Am having 2nd thoughts about what to do though. I might see if they can paint on the Flyer decals as its not that complicated but if I am getting them to do it should I maybe just do it myself? I can easily get the Raleigh sticker, its just the red yellow and blue bits I need. Will ponder it overnight and make a decision tomorrow morning. Right, I know this is a silly question but from this photo of the tyre size, I assume my wheels are 27 1/14? The only reason I ask is because the wheels are blatantly not 27 inches in diameter but that might just be me not understanding how the sizing works. I am just wanting to check as have now got the frame back from the paintshop and need to start putting it back together. I cant really afford to get the wrong ones. I think I might have to do some hunting around to get some with 120mm rear spacing. Just a thought. Why not look for some alloy wheels. Just to lighten things uo a bit. I am I just want to check I have definitely got the size right first before I buy them. Can you confirm? I had thought that this was a simple question but obviously not. Can someone point me in the direction of someone who might be able to help or a website that can explain this? What I have seen so far is suggesting that I look at the rim width which is smaller than 27 1/14. I want to make sure I have the right wheels before I spend the money. So my wheel seems to be 25 1/2 inches in diameter. 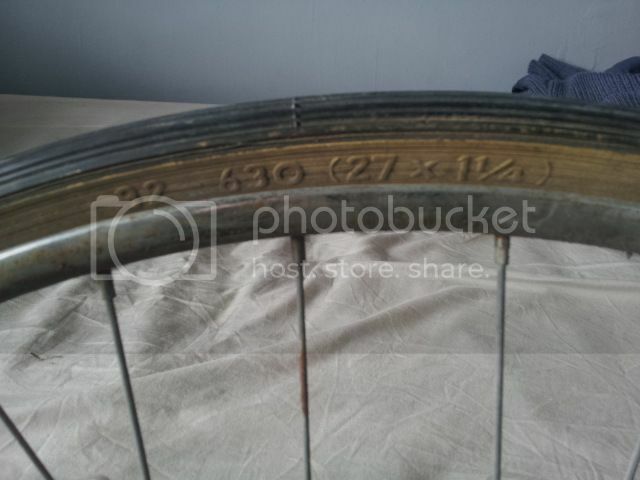 The tyre says 27x1/14 and that seems to be the diameter to the outside of the tyre.